Anyone else brave Black Friday? I'd like to thank whatever corporate marketing team's crazy idea it was to open their store on Thanksgiving night first - and to all those that followed and enticed shoppers to join in their moonlight madness. By the time Mom and I got to Kohl's this morning for our traditional shopping spree, there was no wait to checkout. Last year at sunrise the line wrapped around the entire building. We don't go to fight over limited toys or electronics, so trudging around last night with full bellies wouldn't have saved us any money. The 500+ early bird specials were still valid and there was certainly no danger of Kohl's running out of clothes. Mom and I didn't splurge much this year - but even shopping separately and buying only a few clothing articles each, we managed to pick out two of the very same shirts from their huge selection. Sometimes our similar tastes are eerie! We both collect winged being trinkets. My style is usually a hint darker - I tilt towards dragons, and she toward angels. Every Christmas I try to buy her an angel to add to her collection. I bought her a stained glass ornament at Boscov's today, but she already saw that so I'm still searching. She reads my blog, so I can't share the possibilities - but through the clouds at Etsy, I gazed at an array of silver angel wing earrings I'd be merry to find in my own Christmas stocking! 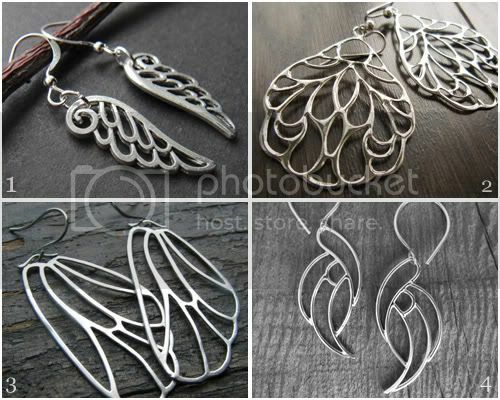 These wing designs are so unique and stood out in a sky filled with angel jewelry. Lovely filigree. Can't say I participate in Black Friday madness, I usually avoid stores from the beginning of Halloween displays until after New Years, but on Thanksgiving I did finally get some technical advice from my two son in laws about electronic equipment, found what I have been needing on line, and then managed to find something equivalent or better in the store but without shipping charges. Gorgeous wing finds! I don't understand the midnight opening thing either. Isn't Black Friday crazy enough as it is? I've been shopping ahead this year and mostly have handmade items left to buy or make.